And the homeschooling journey begins! This week, I started homeschooling Sophie. She's only four, so we are just doing Pre-Kindergarten. I researched and thought a lot about what I wanted this year to look like (and what I want my homeschooling journey to look like). I haven't exactly narrowed it down (I probably never will), but I do have a good idea of the direction I would like to take for this year and for our homeschooling future in general. My main goal for this year is to add some structure to our lives. To get used to having times where we all do the same thing, to be able to sit and listen, to build healthy and helpful habits, and to teach (and learn) some things in the process. Sophie is such an easy kid to start this journey with (thank you, Lord!). She's like her Mama... and she couldn't WAIT to start school! She was so excited and kept talking about it the whole week before. I set out her clothes the night before, and she came down in the morning all dressed and ready. :) She makes me smile. Here's her big, happy smile on her first day of schooling from home! In general, my plan for this year is to read a lot. To establish them in the Word of God. To read some incredible picture books. To read a few great chapter books. I'm also planning to teach Sophie how to read and to teach some beautiful hymns. Sophie is also going to take swimming lessons this fall that she is very excited about. She tells me that she is going to learn lots of cool tricks to show me. Every other Wednesday we have a homeschool co-op that we will attend. God has faithfully guided my heart in all of this, and I am really excited for the school year! After eating breakfast, getting ready for the day, and making sure the playroom is all clean, we start with prayer and Bible reading time. For this time, I have a two-fold purpose. My main purpose is for them to hear the Word of God. I read some from my actual Bible, but I mostly plan to use The Children's Story Bible (which I really, really like!). My second purpose is to teach them to sit quietly and listen during this time. Sophie can do this fairly easily, but Brielle is not very good at sitting (she did improve this week though!). I think it's valuable for kids to learn how to sit quietly for short amounts of time, but I also want to teach them to respect and value the Word of God. After this, we work on a memory verse. This week I decided to do Genesis 1:1, since we were reading that in the Bible. Sophie learned it. Brielle says a few of the words, and it's really cute to hear her say "beginning," "created," and "Genesis." Here are all my students... I only signed up three, but somehow extras sneak in every day. After this time of sitting, I let them choose whether they would like to stand or sit, and we sing a song. I absolutely love modern worship music, and it does wonders for my soul and mind. But I want my girls to learn some of the great hymns of the past as well. So my plan is to mostly teach them these during our music time. This week, the girls learned "Go, Tell it on the Mountain!" Today, I spontaneously decided to have Fun Song Friday, though, and we sang Father Abraham! Homeschooling is great... we can change it up whenever we want! We then read a picture book. For this time, I want the girls to sit and listen, but I also know that for Brielle, it's important to switch it up a little. So I've been using blankets for this time. Today we went to the library to pick out the books we'd be reading for the next couple of weeks, and I was super giddy about picking out so many great books that I have the privilege of reading to my girls. I love introducing them to great literature (and great illustrations). And I'm a book nerd. I then read from a chapter book. We finished up Charlotte's Web this week (which we actually started two weeks ago). Sophie could sit and listen to books all day, for real. But Brielle is not as interested. She's only 2 1/2, but she also has never been as interested in books. So during this time, I either get a snack or a craft for them, and they can also play with toys... just as long as they're not talking to each other or being really loud. And that's it, other than Sophie's learning-to-read book! It all takes probably just an hour of our morning, but it's enough that I feel like we are finding some nice structure. I think four is young to learn to read, and I most likely will do it later with my other girls, but Sophie has always loved learning and books, so I believe she is ready. We are using "Teach Your Child to Read in 100 Easy Lessons," and we just have 95 lessons left! :) Sophie is very excited to learn to read, but this is definitely her least favorite part of the day. It can be a bit repetitive, and though I believe this is valuable and important for her to really learn how to read, she doesn't quite understand that value. Nonetheless, they are short lessons, and she is doing well at them. At the end of each lesson, the book assigns writing. This will be good practice for Sophie since she mostly prefers to write uppercase letters, and the book assigns lowercase letters. I will probably occasionally add in science and history and math, but mostly I plan for these subjects to be spontaneous for this year. As I've heard many homeschooling mothers say, our week was both wonderful and chaotic. Things didn't go exactly as planned, but it was a beautiful week, and I'm really thankful that God has called me to this and allowed for me to stay home with my girls. Brielle and Lyla are young, so keeping them happy and calm and obedient throughout the school time is sometimes difficult, but it's good for me to help them learn these skills. We also spontaneously decided to renovate our playroom this week, including tearing up carpet (that carpet I mentioned that I actually vacuumed!! yeah, it got torn up the next day), laying down laminate, and painting walls and ceilings. This meant that we were kicked out of the school room for a day. I was excited and had plans to do school under these pretty pine trees we have... until I walked over to put the blanket down and saw two dead chipmunks. I wasn't in the mood for moving dead chipmunks with three kids in tow, so we sat on our driveway instead. Not nearly as romantic. But hey, later I was able to show the dead chipmunks to Sophie and give her a lesson about decomposing, so there was value in having dead animals laying under my pretty trees. I love when learning comes through natural occurrences and real life happenings. We had fun afternoons and evenings of playing outside, going to an ice cream shop, and playing with baby dolls. And in perfect timing, my friend Sarah loaned this book to me (Teaching from Rest by Sarah Mackenzie) to read during my first week of homeschooling. 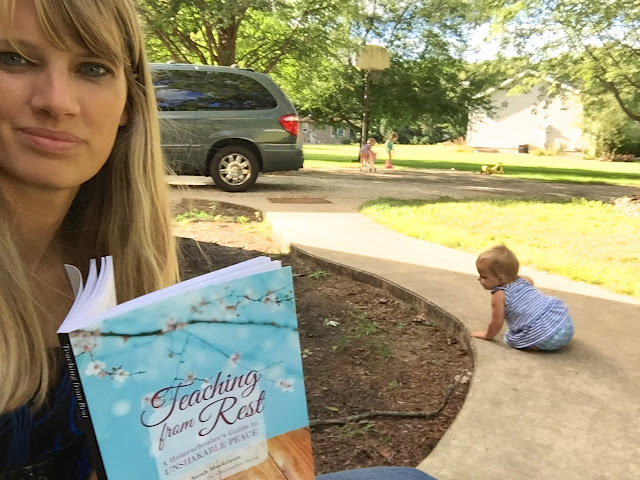 This book is short and had such great truths and suggestions for how to provide a peaceful homeschooling atmosphere rather than one full of chaos and anxiety (and it also was perfect timing because God has been speaking to my heart about this idea of rest for the past month). My absolute favorite times from this week didn't happen during our morning school hour at all, however. On Monday night, I was upstairs with Lyla, and I head Sophie teaching Brielle downstairs. I snuck down and caught this picture. Oh, my heart <3. On Wednesday, I needed to cut up some Bible verses while the younger two napped. Sophie came over and asked if she could have the extra paper. I handed it over, and she started cutting and gluing pieces to make letters. All on her own. Spontaneous learning! Learning doesn't have to happen in a classroom or from a textbook, and I just love that! And to make it even better... after she had made several letters, we realized we could spell some words! One week down... Many, many more to go. What an honor! The grace of God has poured out on me abundantly. p.s. I was nerdy about books and all the school supplies, too. And the kids used to get so excited for all their new books at the beginning of the year! (Especially Josh. He would read his reading books and history books even before school started - it kind of frustrated me because I wanted everything done decently and in order.) This time of year makes me a little melancholy when I walk through the "school" isles at the stores. I have this burning desire to buy school supplies! p.p.s. And you ended up doing science after all, thanks to the decomposing chipmunks!! Thanks, Mom! And thanks for all of your resources and wisdom!